Backpacks are filled with notebooks and pencils, lunches are packed, and bulletin boards are decorated – it’s Back to School time in Arkansas! Many school districts in Arkansas are already back in session, and the rest will follow suit in the coming weeks. Your children may be ready to ace their new classes, but you face a different test each morning and afternoon: school zone driving safety. Whether you cross paths with school buses on your morning commute, see children boarding the bus in your neighborhood, or drive through a school zone near your local campus, Back to School season requires heightened safety awareness from Arkansas drivers. Taylor King is here to give you a crash course in school-related driving safety to ensure you’ll get an “A” each time you get behind the wheel. 1. Stop for School Buses. This may seem like a no-brainer, but Arkansas school bus laws are commonly misunderstood. When a school bus stops on a roadway with either its red lights flashing or its stop sign raised, the law requires all vehicles traveling in BOTH directions to stop. Most Arkansans are aware of this law on two- or three-lane city streets, but it also applies on multi-lane highways. The exception is when there is a median or dividing strip, such as a concrete barrier or large grassy strip dividing the lanes of traffic. Turning lanes are not considered a median. This is important because much of Arkansas is rural, with buses stopping at houses on the edge of highways. Those highways, even those with a turning lane, do not have a median, which means that all traffic in BOTH directions must stop when a school bus is loading or unloading. We believe many drivers violate this law because they do not understand this specific situation, but we can all do our part to help educate our fellow drivers. 2. Be Vigilant Near Crosswalks. Children often act impulsively and don’t always understand the safety risk of stepping into a road. That makes them particularly vulnerable to pedestrian/vehicle accidents. While you should always come to full stop at stop signs and red-light intersections, it’s especially important to do so when children are nearby. Stop fully, look both ways, and proceed with caution through the crosswalk. Even if you’ve followed all laws, you should still yield to pedestrians and avoid a collision if at all possible. 3. School Zone? Slow Down. If you’ve grown accustomed to breezing through school zones in your community during the summer, it’s time to hit the brakes. Arkansas law states that “a person shall not operate a motor vehicle in excess of twenty-five miles per hour when passing a school building or school zone during school hours when children are present and outside the building.” It is also illegal to talk on the phone while driving through a school zone in Arkansas. 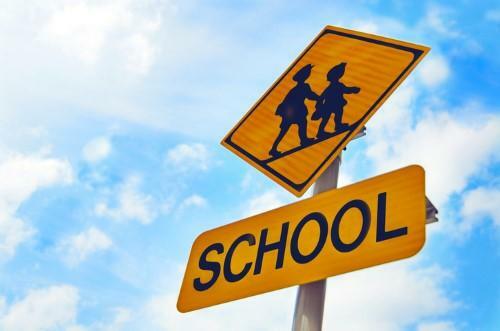 The law also requires ample signs and warnings to be posted at the beginning and end of the school zone, so you won’t be caught off guard – and you’ll have no excuse for speeding past a school. “When children are present” refers to any time when children are present at crosswalks, sidewalks, roads, or highways that are part of a school zone. It also applies to situations where a traffic control person (such as a police officer) is present as well as any time that a sign-mounted light is flashing to warn you of a school zone. Regardless of the time of day, it’s important to be alert and watchful any time you drive near a school building or zone. Early sports practices or late evening events may bring children to roads and sidewalks outside of the “normal” school hours. Watch closely and drive slowly. This is the fifth year for the “Flashing Red, Kids Ahead” safety campaign in Arkansas. The campaign seeks to remind drivers to stop when they see flashing red lights on a school bus (as discussed above). Thanks to Isaac’s Law, named for Bryant elementary student Isaac Brian who was killed in 2004 after exiting his school bus, violating Arkansas school bus laws now carries a stiff penalty. Anyone convicted of passing a stopped school bus will face any combination of a fine of $250-$1000, up to 90 days in jail, driver’s license suspension of 21 days to 1 year, and up to 400 hours of community service. And in cases like Isaac’s where the driver kills a student, he or she is guilty of negligent homicide, a class C felony.